DeSoto ISD officials tour DeSoto H.S. 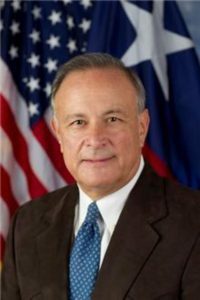 Career and Technical Education facilities with Texas Secretary of State Carlos H. Cascos. 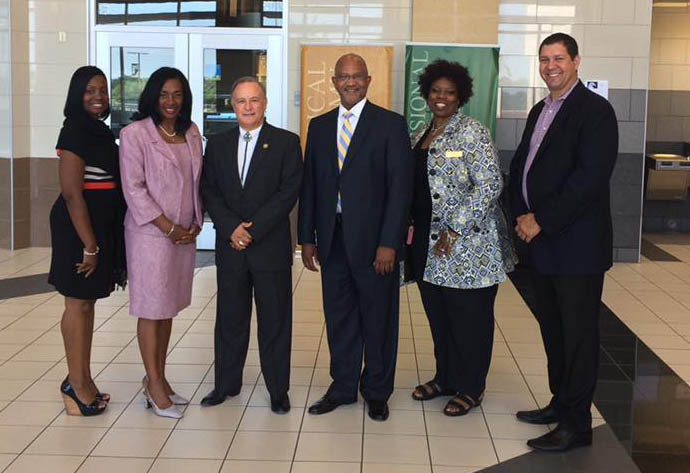 DESOTO—The City of DeSoto and the DeSoto Independent School District recently hosted Texas Secretary of State Carlos H. Cascos. The Secretary of State values the varied and rich opportunities that Texas provides and took an opportunity to visit DeSoto during a recent Dallas/Fort Worth speaking engagement. Talented student chefs of the Career and Technical Education (CTE) Culinary Arts program of study treated Secretary Cascos and members of the district leadership team with a 3-course meal, served with detail in the Court Room of DeSoto High School. Following the meal, students from the International Baccalaureate Program had a private audience with the Secretary. Topics included voting, business development, college and career options and the impact of global economies. Following the panel discussion, CTE Director Dr. Tracy Tolbert, took the Secretary on a tour the Health Science Technology program of study. His high school experience ended with a visit to Sonja Head’s dual credit math class. Next, Andrae Rhyne, GEAR UP Project Director, took the Secretary to McCowan and East Middle Schools. Students in the iSTEAM (Innovative, Science, Technology, Engineering, Arts and Math) Program at each campus took the privilege of showing the Secretary their projects, emphasizing the real-world applications afforded through the problem-based learning environment. Band directors at McCowan Fine Arts Academy were able to demonstrate how technology has advanced instrumental music instruction. Students at East’s Medical Magnet Program were able to walk the Secretary through an analysis of a mock crime scene and were able to use forensic evidence to defend their conclusions on a cause of death. The Secretary’s visit ended with an intimate conversation with Councilwoman Candice Quarles. Mrs. Quarles, who represents Place 6, explored topics that included economic development, the Texas political landscape, voting trends and responsive governance. Secretary Cascos congratulated DeSoto ISD for innovative programs, engaged students and visionary leadership.